Quality work, customer care and quick response times are what we have become known for at Car‑Wal Garage Doors. Since 1973, our business has exceeded our clients’ highest expectations. 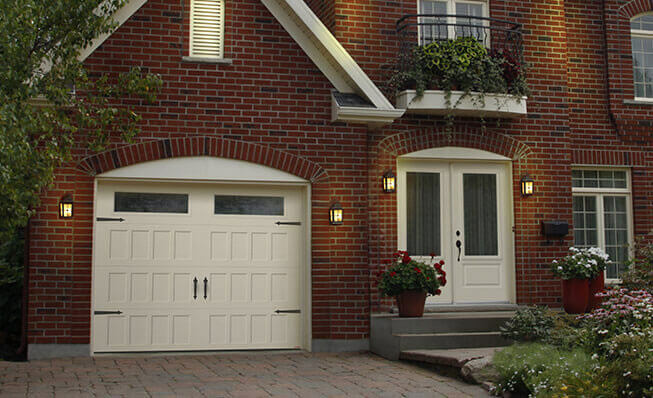 If you need garage door services of any kind, call our Guelph office today at 519-821-4400. For 24‑hour emergency garage door services you can count on, Car‑Wal Garage Doors is here to help. If your garage door isn’t working properly for any reason, give us a call at 519-821-4400. You can also fill out our service call form. Our company serves Halton Hills and surroundings, including Waterloo, Guelph, Oakville, Simcoe, Port Colborne, Brantford, St. Catharine’s, Grimsby, Beamsville, Binbrook. In the market for a new garage door? As a city located in the northwestern end of the Greater Toronto Area, Halton Hills has many different house styles. From contemporary to traditional, our company carries garage doors for every possible architectural style. Take a look through our image gallery to see for yourself and get ideas about the perfect garage door for your home. At Car‑Wal Garage Doors, our specialties are installing, maintaining and servicing garage doors. We carry all kinds of replacement parts and numerous decorative accessories for adding charm to your home. We service garage doors for things like spring replacements, broken springs, garage door opener parts and much more. Door openers make it so much easier to get in and out of your garage. For great accessories and reliable performance, go with LiftMaster products. We have options for commercial, industrial and residential garage opener needs. Living in Halton Hills means having a pretty cold winter, and humidity throughout summer. To keep your home nice and comfortable, consider an insulated garage door. You’ll receive an R‑16 level of thermal resistance with a Cambridge or Standard+ garage door model. Aside from the improved level of energy efficiency, you’ll also love the way it looks. You can even design your own in our Design Centre. Halton Hills has 3 communities in its city: Acton, Georgetown and Limehouse. Acton and Georgetown are the primary population centres with 9,462 people in Acton and 42,123 people in Georgetown. Please feel free to call us or ask for a free quote now!